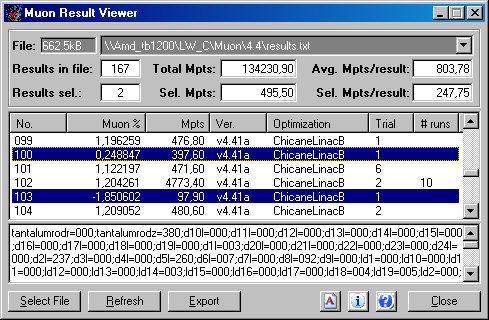 Muon result viewer (MRV) is a tiny program to get some more information out of muon result files than possible with notepad or other tools. MRV was written on two long nights in june 4./5. 2004, followed by some testing, bugfixing, writing help and creating web page. It is dedicated to the friends of Stephen Brooks Muon DC project all over the world and of course it is free! Overview Gives a short description of muon result viewer. Version History Version bugfixes and enhancements. 1. Muon result viewer (MRV) provides user with the ability to take a quick look into a muon result file. It doesn't matter what kind of result file is selected, because all formats - even the latest version - are supported. It is also possible to view *.dat files of muon instances. 2. MRV was primarily designed to get out the number of results, the best muon percentage and the total Mpts accumulated in a result file. Results are offered in a list, where each single result is found as a list item showing additional informations like client version, optimization, trial type and number of runs. 3. The list sorting is the same order as results were written to the result file. Of course, you can change sorting order after the first view was shown. 4. Another nice feature is free multiselection of list items. Always if you run multiple optimization types in one client instance, it is hard to get an idea what optimization type has produced how many Mpts. To get the values of only one optimization type, build blocks of the same type by sorting for optimization. Then select the appropriate block of list items. The summary using only selected items is shown in the second row of fields. This multiselection feature is available for any other individual item selection, which may be useful. 5. Export allows you to write all selected list items into a semicolon separated text file. When creating the export file, MRV respects the current list sorting. The last used export folder will be preset on a new export, so you can collect your export files easily in a central folder. 6. MRV is not shown in the task bar, but resides in the system tray. If you minimize it, you can access main functions using the popup menu of the tray icon. Double click the tray icon brings it in the foreground (if it's open but behind other windows) or restores it back if it was minimized. v1.00 - v1.13: 158) Muon result viewer is written in pure VB6 without using 3rd party components. In the very most cases it will run without any installation after copying the exe file to your harddrive, if the common VB6 runtime files are available on your system. Read about the few requirements in section Technical Details. v1.00 - v1.13: 077) This setup installs muon result viewer automatically. VB runtime and other needed components are included and will be copied to your system if neccessary. If you once have run setup, you will only have to replace the plain program file MRV.EXE in the future, if a new program version is available. Selected file File and History The file size label shows the size the currently selected file. The file drop down list shows the full name of the currently selected file. All informations seen in MRV are related to this file. Additionally, the drop down list acts like a history of all prior files, offered for quick selection. New file selections are added automatically to the history list. File history is stored in a simple text file MRV.dat located in the program folder. To remove useless entries, user can load the file into notepad and delete the appropriate line(s). Double-click the file size label opens the same file selection dialog as done by pressing Select File button. File Summary Results in file Number of results in selected file. Total Mpts Total Mpts in selected file. Avg. Mpts/result Average Mpts per result in selected file. Selection Summary Results sel. Number of selected results in list. Sel. Mpts Sum Mpts of selected results in list. Sel. Mpts/result Average Mpts per result of selected results in list. List columns No. Sequential number from the first to the last result in file. Mpts Mpts to calculate the result. Ver. Client version of result. Optimization Type of optimization used for this result. Trial Trial type effective on result. # runs Number of rechecks for best-so-far results done on result. List Multiselection How to Multiselection can be performed on several ways. Select the first item, then hold shift key and click on the last item. Select a single item by holding ctrl key and click the item. Select multiple blocks of items by selecting the first item as described above and then holding ctrl-shift key and click the last item. Result details Text field This text box shows the scientific data of the selected list item. The program doesn't deal with this data in any particular kind beyond showing it. If more items are selected, details from the last selected one are shown. Command buttons Select file Let user select another file to view. Files can be selected from any local drive, from mounted network drives or via UNC path. The program supports all kind of result files like results.txt or results.dat. If stored, also older result files of prior muon client versions can be viewed. If you select large *.dat files (<10MB), parsing of many ten thousand results can last some seconds, depending on your machine speed. This is indicated by a text like Retrieving xxxxkB data from result file ... please wait a moment shown in results text field. Refresh If muon result viewer is running all the time (i.e. hidden in system tray) and is checked only sometimes, user can press Refresh button to reflect current result file's last changes in summary and list. While export is running, this button changes caption and acts like a cancel button to stop export. Export Multiple list items can be selected to show Mpts of selection. Pressing Export button lets user write selected list items into a semicolon separated text file. Edit history list Edit button to open MRV.dat in editor. MRV.dat contains the history list of prior selected files, shown in the drop down list. Each line represents a particular result file, which can be deleted if it is obsolete. Note: Refresh button also fills the history drop down list from current MRV.dat. Info (About) Shows version and copyright info about muon result viewer. Info has a link to create an eMail to submit feedback to the program author. Help Shows this help file. Tries first to open a local file in current program folder, otherwise opens from the internet. Close Closes muon result viewer. Minimize Window Hides muon result viewer and leaves only the tray icon. System Tray Hidden state If MRV is hidden after minimized the program window, user have access via MRV icon in system tray. Double-click restores MRV window again and right mouse-click pops up a small menu, where user can select another file, show or close muon result viewer. Initial selection The last selected file is stored into registry on program exit and used to make the initial file selection on a new program start. If the last file selected doesn't exist on program start, the common file selection dialog will open and ask for another file. On program start, muon result viewer looks for a file named results.txt in his current program folder. If found, this file is automatically opened on startup, regardless what file was selected the last program exit. Window position The last window position is stored into registry on program exit and restored on a new program start. Export folder The last export folder is stored into registry on program exit and used as preset for the next export destination. If program will not run after simple copying the MRV.EXE file, you will have to download full setup and run installation. No other files are created or changed, except history file MRV.dat and user initiated export files. Selected result files are only opened for read access. Never will MRV change anything on result files. When running installation, only missing VB6 components and Windows Common Controls are copied to the system. Only parsing will use some hundred milliseconds up to some seconds in the case of large files. After selection and showing the result list, MRV needs no CPU time. Memory usage is depending on the size of selected result file, because all information is hold in memory. This was the first version introduced to the public. If a results file was empty, MRV run into an exeption. This condition is now handled by showing also an empty results list. As described above, muon % column sorting was fixed last week. But after sorting for muon %, the topmost row (containing the highest or lowest %) was not shown in the list. This behaviour is now fixed. Some people asked me to enable resizing the viewer form. This is now possible in vertical direction and enlarges the results list. Edit button added in form footer to open MRV.dat in editor. MRV.dat contains the history list of prior selected files, shown in the drop down list. Each line represents a particular result file, which can be deleted if it is obsolete. 1. A file selected from history drop down list does not exist still more (i.e immediately after sending a results.txt). 2. The subsequent file selection dialog was cancelled without selecting another file. 3. After cancel, all summary values and list contents stayed unchanged, but the file in the drop down list was still the not existing one and not the prior, to which all values and list contents relate. This behaviour is now corrected.